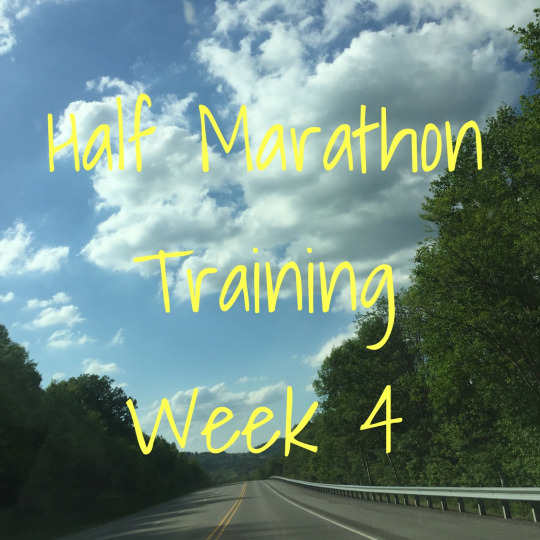 This week I'm taking a break from being on a workout schedule. I just finished Way Of Gray's workout plan, months 1-3, last week. I liked it, but I didn't love it enough to buy the second half. I decided to take this week and just do whatever I feel like doing before jumping into something else. So far it's been lots of cardio along with this workout. I came up with this the other day when I wanted to do a little bit of strength training. I thought it would be fun to take my workout outside. I love working out outside which is the main reason I stopped lifting in February. Probably a little early for someone who lives in Pennsylvania, but what can I say?!? I was anxious to get back out there. With that being said though, I am going to start lifting again next week! But more on that in the future. Anyways, I just went out in the woods and came up with things as I went. I wanted to share to inspire others to try new things and take their workouts to different places! I really had a ton of fun with this and it was actually pretty challenging! I did a quick warm up of a fast paced walk through the woods and then got to work! I ended this with a cool down of another walk and a bit of stretching. So much fun! *I am not a certified fitness professional. This is simply a workout that I followed and worked well for me personally. It's meant as inspiration and a fun way to get creative with your workouts, nothing more. If you try it; practice correct form, be mindful of your body and your limits, be safe, and have fun! On Sunday I checked out Orangetheory with my friend, Caitlin. I discovered that your first class at Orangetheory is free and I couldn't pass up an opportunity to take a free workout class. I posted on Instagram about wanting to give it a shot and she decided to join me! We booked a class for a Sunday morning so that we could grab lunch afterwards. Going into it neither of us were quite sure what to expect. We're both pretty independent with our workouts and don't do much in terms of group fitness classes. You're probably wondering why we even did it in the first place then. Well to try new things, of course! We arrived at Orangetheory a half hour early to fill out some paperwork, get our heart rate monitors, and get a run down of what to expect during the class. The space is conveniently located at 5841 Penn Ave. in Pittsburgh with plenty of street parking available. Upon entering we were greeted by two friendly employees who showed us around and made us feel comfortable in the studio. Lockers, restrooms, and showers are available. Everything is very clean and laid out well in the space available. The workout room is well lit and spacious with tv's placed properly throughout the room so that you're able to check your heart rate throughout the class. Each day the workout is different and on Sunday we did a class that consisted of half cardio and half strength training. Caitlin and I started out on the treadmills. I was glad about that because treadmill workouts is far from my favorite thing to do! Plus, personally I like to get the cardio out of the way before the strength training in my workout. On the treadmills we did interval training with some incline thrown into the mix as. It was tough! But the time went by fairly quickly and we switched over to the strength portion. We started out on the rowing machine and rowed for the duration of the time that we were instructed. Then we switched to weights and did 5 sets of two exercises at various reps before jumping back on the rowing machine. We alternated between weight exercises and rowing for that portion of the class. It went by so fast! I had a lot of fun with it and by the end I was definitely feeling it! After class is over you get a short stretch and can check out your heart rate results on the screens or look them over in your email. It was cool to see how hard I worked throughout the class and recognize that pushing yourself to crazy limits isn't the best way to do things. The program is designed to work and challenge yourself to create an afterburn which will increase your metabolic rate for 24-36 hours after the workout. Overall, I had a great Orangetheory experience. It's not something that I would do regularly but I would go back on occasion for a class! Everyone was friendly, the environment was welcoming, and the workout was a great workout. It's definitely something that I would recommend giving a try! After taking that class I was wondering about other fitness classes that I can try out. Do you have a favorite fitness class that I should try? If so, let me know! I've had an on and off relationship with the gym since I was 16. Sometimes I'd be really "on" and other times I would disappear from there for months. I'd still workout, just in other ways. For example, the past two summers I stopped going to the gym because I did workouts at home. Major cardio and very little strength training. Cardio was my favorite. There was (and still is) nothing better than going out for an early morning bike ride or run in the summertime. My absolute favorite! All good things come to an end though and so did my daily biking and running adventures when the leaves started to fall and the snow started to fly. That's why I turned back to the gym once more. Last November I walked into the gym to rejoin for the winter. I was bored with Youtube HIIT workouts and knew that I wouldn't stick with running (and definitely biking!!) out in the frigid winter temperatures. Lifting would have to suffice. I browsed the internet for a lifting plan which isn't something I've done before. A few years back I had an awesome group of gym buddies who would basically guide me along through a workout each night we lifted together. It was so much fun! I learned a lot back then and I'm so grateful for that! The old crew isn't able to all get together anymore like we used to though and I was basically on my own. I came across a 4 week lifting plan and decided to go for it. I knew what all of the workouts were and knew that it was a reasonable starting point for me. I showed up to the gym everyday for the next 4 weeks at 6 a.m. and completed my workouts. I was super proud of myself for getting up and showing up each morning. I didn't really notice much of a difference in my strength or body but I enjoyed the workouts so I was motivated to keep going. Once that plan was over I found another one and decided to give it a try. You can find it here. It's a 12 week program that switches things up every couple of weeks. In the beginning I wasn't really feeling many benefits from it but once I made it past the first few initial weeks then things really started to get better! I am currently on week 8 and I have gained so much strength. I feel stronger and people are telling me that I look stronger as well. Yay! The workouts are so much fun and I really enjoy doing them to the point that I now go to the gym at 5 instead of 6! I also go to bed earlier than I ever have in my life to make that happen without being exhausted. It's all worth it though! Plus it's so dark all evening in the winter and there's nothing else going on so early bedtimes are easy. But anyways, the workouts are about 90 minutes at this point in the plan but those 90 minutes fly by like nothing. I'm challenged in my workouts but also not overwhelmed. I feel like the way that the guide is set up gives you the tools you need to build yourself up little by little throughout the process. As I find myself learning more in the gym and becoming stronger I love it so much more. I have gained the confidence that I needed to workout in the lifting part of the gym which seemed so intimidating before. But it's really not! I know that a lot of people are intimidated by others in the gym and you need to know that no one cares or pays attention! Do your thing and do it with confidence. You got this. I will be finishing this plan in the middle of February and plan on doing another update then with an overall review of the plan I'm following as well as what I'll be up to next. I haven't really shared my workouts on this site for years but I want to get back into doing so because I love it so much and it's such a big part of my life, so here we are! Stay tuned for more and share with me the lifting workouts that you're into! Week 4 already, what?! I can't believe it. This week was a pretty challenging week for me! I've been dealing with a large increase in my leg/hip pain and struggled throughout the whole week. But I did it and got through the week! Let's check it out. As a reminder, I’m basing my training off of Life In Leggings training plan but I have mixed some things up a bit to fit my own needs! Today was interesting! I planned to get up early and get my 9 miles in before the rest of the world woke up. I was out the door at 7 a.m. At that time it was just sprinkling a bit, nothing major. I did my first three miles in my new shoes that I mentioned last week. Then I headed home to switch back to my old shoes until I got the new ones broken in. By the time I went back out it was pouring! I finished off my run in the pouring rain. There wasn't a dry part of me! At one point I was laughing at myself for how ridiculous the moment was. I saw some ducks floating in the river I passed and I've never wished so badly to be a duck. Seriously! But it was fun and felt very empowering to be out there doing my thing. I'd prefer not to make this a regular thing but I can deal with major downpours every once in a while. It makes things interesting! I wasn't too concerned with my time. I just wanted to get the miles in. The first three miles were kind of painful on my leg, but after that I had no issues. Woo! Rest day! I didn't do much today other than a short walk with the dogs as usual. It was nice after Sunday's rainy run! I was really excited for this run on Tuesday. It was the beginning of a struggling running week though. I had 4 miles to do and I thought that'd be no problem. Well I started running and my legs felt like bricks. I get really frustrated when I run "slow" and am trying to get over that. I'm not going into this half with any time goals. I just want to finish it and have fun. I need to remember that. My leg/hip injury was causing me a ton of trouble to the point that I questioned if I should continue running this day. I finished it off though and I'm glad that I did! I was in pain the rest of the day though and that set the tone for running the rest of the week. Strength Training! Youtube is my lifesaver when it comes to this. I love that there are so many free workout videos available! I did this workout which was pretty good! I was definitely sweating by the end. The thing that I love the most about HIIT workouts is that they go by so quickly! This was over before I knew it. Love it! Today was frustrating. So frustrating. I was having major hip pain during the whole time pretty much. I was running slow which was discouraging me quite a bit. I couldn't move my legs any faster though. My legs felt so heavy and I know that it's because I've been having problems with my leg/hip. I finished the run though and was glad that I did. I decided to make a chiropractor appointment asap afterwards to try to get this problem solved, finally. Three miles! I got new shoes (again whoops) because I didn't like the Mizuno's that I got last week so I swapped them for the Saucony Kinvara 5. So far I only ran in them today but I will make a detailed post about them in the future! This run was pretty nice. It was done at an easy pace and I had very minimal hip pain! I went to the chiropractor in the afternoon. He told me that I can continue with my normal training but not to do yoga or sit cross legged. Do you know how hard that is!? Those are both big time habits in my life that I enjoy a lot. Ahhh. I'm willing to give it a shot though if it'll possibly heal me! Today I rested completely. I took a short walk with the dogs but that's it. No stretches. No sitting cross legged, if I can help it. My hip/leg has felt a bit painful today but nothing compared to usual. Maybe this will help me?! I had many times during the week where I regretted even starting this training. I can't help but to think about how differently things would be if I wasn't injured. It's very hard to get out there each day and complete something when your body isn't 100% but you have no control over it. When I signed up for the half I just went to the doctor and chiropractor for the first time to assess the injuries and they both told me that I would be able to train with no problems. I signed up and have struggled the whole way through. Hopefully no that I am doing no stretching I will heal and do it quickly. But time will tell! Sorry if this post seems negative. I want to share my honest experience with training here because it is definitely not all beautiful runs through a field of wildflowers on a nice summer morning. There are challenges and I am sure that I will be stronger once I overcome them but it's also scary to attempt whenever an injury is involved. Two more weeks to go though, so exciting!! Week three is in the books. Awesome! This was a great training week for me. I got new shoes, a new watch, and had awesome runs. I'm excited to share it with you and I'm excited to continue on this journey! Sunday was 8 miles. 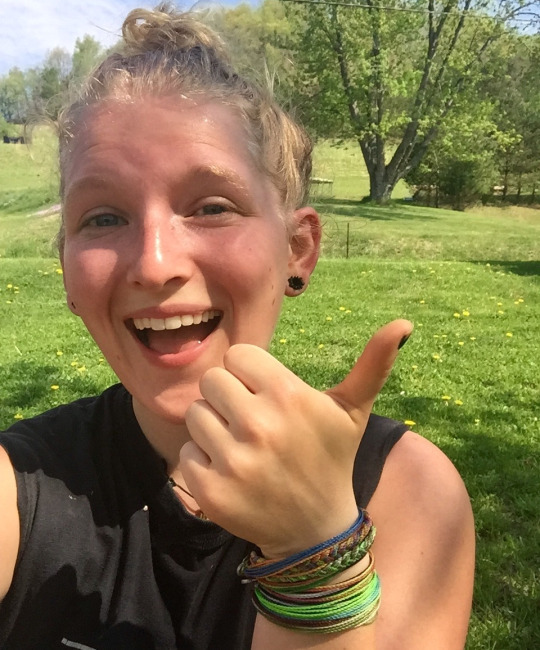 I love long runs the best so I was pretty excited about it. I set out and got it done. It was quite the roller coaster. I started off with a huge hill about 1 mile in that was pretty tough but really great to accomplish at the same time! I encountered two more tough hills near the end of the run as well. The hills slowed my time down quite a bit but I'm totally okay with it because I know that running hills is so beneficial to me overall! The 4 middle miles were pretty awesome and effortless. I run on backroads through the woods and the leaves are on the trees finally so that gave me a ton of shade that was greatly appreciated. The last 2 miles were a struggle. I didn't get up early enough and by the time I was finished with the run it was about 85 degrees!! I definitely worked up a sweat and was grateful for ice water after I was finished. Rest day!! Woo. I really wasn't feeling the need for a rest day today and I was going to just listen to the training schedule and chill out for the day. My mom asked me to go for a bike ride though so we went an easy 5 miles. Then I went for a walk with the dogs, did this yoga video, and jumped on the trampoline for a while with my sister. We've had a trampoline for years and it is still one of my favorite things to do! Nothing was really high intensity today and that's all that I was concerned with. My body feels good and I feel energized so that's what matters! Tuesday This was an early one! I had a pretty busy day planned for Tuesday and I knew that I needed to get my run in before I did anything else. It was a really nice morning and I ran as the sun came up. I felt really motivated (and pressured) to get it done in a short period of time to make it to an appointment that I had at 6:45 that morning. I did it and it was great! Today was a cross training day! I wanted to go biking but it was way too cold for that. Well I probably could have did it, but I decided to do a workout at home instead. I did this video from FitnessBlender. I love their workouts and I really think that it was a better choice than biking anyways! I finished it off with yoga. I definitely enjoy practicing outside much better than inside but I'll take what I can get! 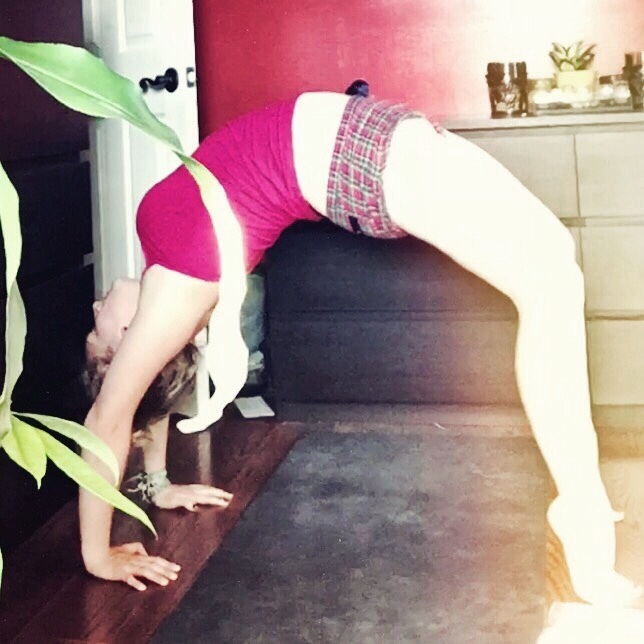 Everyday I do yoga, but usually it's my own practice which is why I don't share much about it. But I can if that would be beneficial to some of you! Six miles to tackle! I had to do this run after work which is my least favorite. I prefer to get up and get things done. But that can't always happen and I was determined to get this run in because I bought new running shoes and I wanted to try them out. I got the Mizuno Wave Hitogami 2 shoes which I plan to review later on next week after I have spent some time (and miles) in them. I did my first two miles with them and then stopped back home to get my old shoes and finish the remaining four. I was actually very pleased with this run and had fun! I just need to work on breaking in those new shoes. Today I received a Garmin watch and had 3 miles to do. This watch is a game changer. I am so excited to continue training with it and can really see myself improving so much more while using it. I ran this in my new shoes and it was the best run of the week. I enjoyed it so much more than I thought that I would. I don't know if my new gear made me excited or what it was but I loved every step. I can finally share my pace now too. Yay!! This was supposed to be a rest day but I got an invite to bike with my friend. I rarely turn down any fitness related offers so of course I said yes. We did 15 easy miles and had a great time. I took it easy and didn't push so I'll just call it an active rest day! And afterwards yoga, of course! I am feeling so awesome after this weeks training. I feel as if I'm gaining stamina and continuously becoming more inspired after completing each day. My body is feeling great for the most part. I have some issues wit my leg still but it's nothing that hinders my training. Very thankful for that! I'm extremely proud of myself for getting in each day of training. It required some early mornings and later evenings but I made it happen and that's what matters! I am also excited to complete this upcoming week with my new shoes and watch. I am interested to see how they affect my runs, if they do at all. I am grateful to have both of them and I think that using them this week will help me to stay motivated and excited which is so important for me to do well.